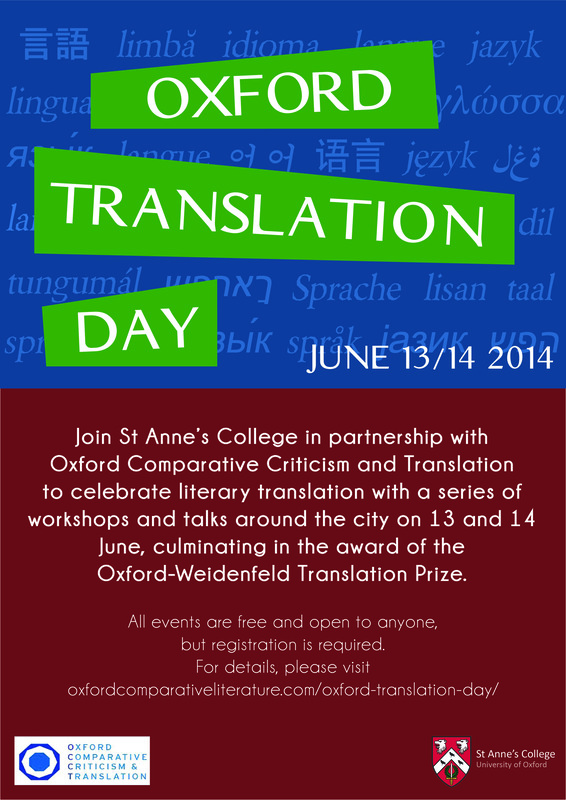 On June 13th and 14th, 2014, St Anne’s College hosted the first annual Oxford Translation Day, a celebration of literary translation consisting of workshops and talks throughout both days at St Anne’s and around the city, culminating in the award of the Oxford-Weidenfeld Translation Prize. Our programme included a range of events which are all open to the public, providing students, translators, publishers, writers, and anyone interested in languages with the opportunity to discover and discuss literary translation. Oxford Translation Day is a joint venture of OCCT and the Oxford-Weidenfeld Translation Prize, in partnership with Oxford Student PEN, the Poetry Translation Centre, the Oxford German Network and East Oxford Community Classics Centre. All events are free and open to anyone, but registration is required. Please RSVP for each event you wish to attend to phoebe.nicholson@st-annes.ox.ac.uk, providing us with contact details (preferably an email address). Crib-sheets will be provided: no prior knowledge of French necessary! Celia Campbell and Jonathan Katz, both classicists at St Anne’s College, will discuss English versions of Odes by the great Latin poet Horace (1st century BC), considering some of the problems that face translators and some of the solutions found. The talk will be accessible for Latinists and non-Latinists alike, and all will be welcome. The Poetry Translation Centre celebrates its 10th anniversary this month with the publication of My Voice: A Decade of Poems from the Poetry Translation Centre, a dazzling array of 111 poems translated from 23 different languages – from Arabic to Zapotec – by 45 of the world’s leading poets, edited by PTC Director, the acclaimed poet Sarah Maguire. For this special event, Sarah will read translations from the anthology accompanied by Sudanese poet Al-Saddiq Al-Raddi reading his own outstanding poems in Arabic. Working with pre-circulated texts, participants will make use of various props and prompts that will encourage them to push their translation practice beyond textual fidelity and to craft translations that manipulate and play with the target language. This workshop will activate the unexpected, creative and transformative places to which translation often brings the translator. Knowledge of Spanish preferred but not required. To see a report and images of the session, please click here. 2) Oxford German Network: Translation Slam! Oxford German Network in conjunction with Oxford Translation Day invites you to participate in a translation workshop hosted by OGN and Charlotte Ryland, Editor of New Books in German. Participants will be introduced to some of the fundamental issues surrounding translation and take part in a collaborative translation slam. Dictionaries and texts will be provided – but please bring your own pen and paper! Some knowledge of German required. Marina Warner (writer, mythographer and Chair of Judges for the Man Booker International Prize), Rebecca Carter (publisher and literary agent) and translator Flora Drew in discussion about world literature and translation. Patrick McGuinness will read from Other People’s Countries (‘the great book on Belgium and modern memory’ – Guardian), Matthew Reynolds will read from The World Was All Before Them (‘a fascinating, strange and formally delightful novel’ – Independent), and they will join in discussion with one another and the audience about languages, places, fiction and memory. The Oxford–Weidenfeld Prize is for book-length literary translations into English from any living European language. It aims to honour the craft of translation, and to recognise its cultural importance. It is funded by Lord Weidenfeld and by New College, The Queen’s College and St Anne’s College, Oxford. Those translators short-listed for the prize will discuss their work, and the prize will be presented to the winner.